I couldn’t resist the title. After the Denny/Harvick incident I actually tweeted that. But I am getting ahead of myself. Bristol is one of my favorite tracks to watch on television; it and Martinsville. I guess I am a just a short track racing girl at heart. Jeff Burton was again piloting the #14 Bass Pro Chevy for our driver Tony Stewart. He qualified the #14 25 for the race- I wasn’t able to catch ANY of practice or qualifying so I couldn’t gauge how the car was running and had no idea what to expect from our team 14. It was another bad luck race for Tony Stewart and Team 14 at the evil little tricky triangle track known as Pocono. 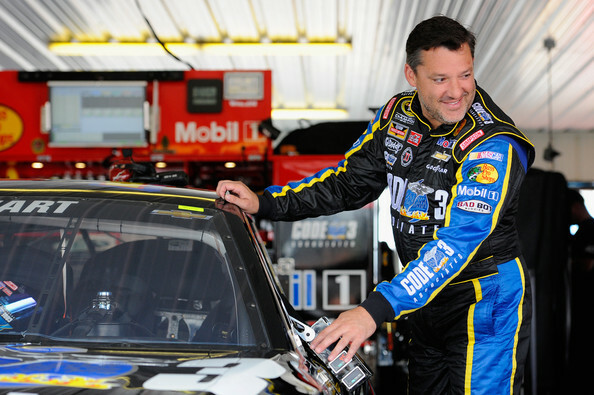 It started with Tony Stewart qualifying the #14 Code 3 Associates/Mobil 1 Chevrolet 16th for the race in Long Pond, PA. The race start time was moved up slightly because of possible weather in the area in the afternoon. I was actually kind of impressed- previously NASCAR has been resistant to moving race start times to outrun weather. I liked that the were being a little more proactive. The Bonus TQMS*: Say What? Tony Stewart, driver of the #14 Code 3 / Mobil 1 Chevrolet, gets into his car in the garage during Practice for the NASCAR Sprint Cup Series GoBowling.com 400 at Pocono Raceway on August 1, 2014 in Long Pond, Pennsylvania. *TQMS= The Quotable Mr. Stewart. Click here for previous editions of the TQMS posts. Wow…what a bizarre race Richmond ended up being! I guess the three major issues ended up being clashing crew members in the pits (between Menard and Johnson who were pitted side-by-side), Carl being black flagged for jumping the restart, and that last debris caution. And I have opinions on ALL of it of course. The problem is where to start. So Tony didn’t have such a great qualifying effort and started the race from 22nd position. Despite what Tony said about the pit crew issues during the race? I think having a crappy pit box may have been part of his pit road issues. Not that there weren’t other issues- I am sure there were. But the crappy pit box that comes with a mediocre qualifying run can damper your race on/off of pit road. However, I think it speaks volumes about the car and the team (and of course our smokin’ driver Tony) that the car seemed to be able to slowly work up the field despite the pit road issues- whatever they may have been. So this is the 1000th post on BadGroove. Actually if you want to be all technical about it, the post announcing Tony’s Chicago autograph session (pictures of this coming soon) was the 1000th post that was posted. But this post was in draft form before that one with this title so I still like to think of this as the the big 1000- don’t you? I definitely do. I think I should get a present! What do you get a blogger for their 1000th post? Let me guess, um, a swift kick in the rear right? If that is the case, I will pass on the present. I have always had a huge love of music and as I mentioned in earlier in both The Music Of Bristol Part 1 and The Music of Bristol Part 2- I have fairly eclectic tastes in music. For that reason alone I really wish they had played driver introductions in their entirety during the prerace show. 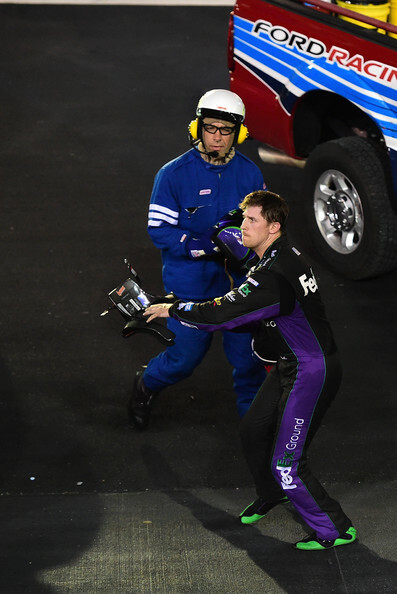 I think that the choice of songs really helps highlight one of the best things about NASCAR and that is the personalities of the different drivers. I admit that the whole twitter deal between Brian Vickers and Jimmie Johnson made the choice of introduction songs even more intriguing to me. Jimmie Johnson recently started tweeting (@JimmieJohnson) and to welcome him to the tweeting world Brian Vickers (@BrianLVickers) and he decided it would be fun to let each other and their twitter followers pick each others introduction songs. That alone right there should have made introductions more TV worthy. Apparently there was some legal reason that they couldn’t show intros (that and the time constraint on the pre-race show, I suspect). Anyway- in case you were wondering Brian Vicker’s got introduced to Shania Twain’s Man, I Feel Like A Woman and Jimmie Johnson got introduced to Sisqo’s The Thong Song. Some songs choices that interested me were: Paul Menard picking Black Label Society’s Concrete Jungle. I don’t know if he actually likes BLS or if he just picked it because that is exactly what Bristol is…but I liked that choice. I also loved that two drivers picked Avenge Sevenfold songs (Matt Kenseth picked Nightmare and Regan Smith picked Welcome To The Family). Clint Bowyer’s choice of the Theme to The Good, The Bad and The Ugly cracked me up. And how fitting was Bill Elliott’s song choice of Devil Went Down To Georgia by The Charlie Daniels Band and Bobby Labonte’s choice of God Bless Texas by Little Texas. The only driver who’s song didn’t seem to match the driver was Kasey Kahne’s choice of A Country Boy Can Survive by Hank Williams Jr. It’s not that I don’t like that song- I do. But I don’t hear Hank Williams Jr and immediately think Kasey Kahne- it just didn’t fit Kasey in my mind. If you are interested in the complete list of driver introduction songs check out this article over on sbnation. Honestly I could probably go down the entire list and muse on for a paragraph per driver- but I won’t bore you there. Tony Stewart was introduced to his standard Bawitaba by Kid Rock. Which I guess he must REALLY like it since he always uses it. I still stand by my assertion that Tony needs to pick a new introduction song. If he needs help all he needs to do is come here (or poll his fans) because we got some great suggestions for Tony when I called for suggestions on the first post of this series! Those would be (in no particular order): Real Good Man by Tim McGraw (which happen to be suggested by winner Claudia), Rough N Ready by Trace Adkins (I love Trace Adkins), When You’re Hot You’re Hot by Jerry Reed, Sound of Madness by Shinedown, Smoke On The Water by Deep Purple (hey Tony does like classic rock), Dirt Road Anthem by Brantley Gilbert and Colt Ford (suggested by our other winner Dudley- which is funny because I have been on a Colt Ford kick lately), #1 by Nelly, and Gasoline by Kicking Harold (which I had never heard before but I really like this song now that I have). All great songs to be used as introduction songs for Tony Stewart…but I still like my choice of I Don’t Want To Stop by Ozzy Osbourne best (see The Music of Bristol Part 2) even though Tony told me in our second interview with him that he isn’t a big heavy metal guy. Now if only we convince him to pick one of our songs just to mix things up a little bit! I mean seriously Tony- I like Kid Rock too, but we have some great suggestions for you to pick from here. Anyway congratulations go out to Claudia and Dudley who were the winners of the contest I held as part of the Music of Bristol posts. Their Goodyear Racing prizes are on their way to them! I just wanted you all to know that the winners were picked randomly and not based on how many comments each entrant made (some people made multiple comments and that was totally fine- but they still only got one entry into the contest) or what song you picked. Basically I put your name on a post-it note (pink for the girls and white for the guys) and picked one of each out of my old 20 knit cap.